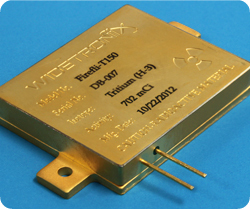 Widetronix designs and manufactures ultra-low power sensor platforms with lifetimes designed to exceed 25 years. A core component of our technology is the use of an innovative energy source, called a betavoltaic, which powers the autonomous sensor platform. Our platform stores the continuous power produced by the betavoltaic and uses it to take measurements and transmit data. Widetronix is an early-stage venture spun out of Cornell University. Widetronix is actively collaborating with customers on defense, medical and industrial applications. The company has expertise in semiconductor design and fabrication, as well as ultra-low power electronics. Demonstration betavoltaics are currently for sale to customers with the proper licensing documentation. If you would like further information, please use our contact form. Widetronix becomes a Red Herring Finalist in the Top 100 North American forum that celebrates the top private companies in the region. Widetronix achieves 'Top 200' status. AlwaysOn annouces their annual GoingGreen Global 200 award winners.